In the last quarter of the 19th century, the way in which handguns were viewed and used was changing dramatically. Originally, handguns had been viewed as weapons to be used in a last-ditch effort to stave off hand-to-hand combat. By the 1880s manufacturing methods had advanced to the point where accuracy and reliability were getting to the point that a good shot could legitimately expect to hit a softball-sized target at 50 yards. As these skills developed, so did the desire to compete and pit those skills against those of one's friends and neighbors. Thus, bullseye competition was born. In the early days of bullseye competition, the S&W Model Number 3 chambered in .44 S&W Russian was one of the most accurate revolvers of the day, and was used by the vast majority of the champions. The standard load was a 246 grain lead round-nose bullet, launched at a little over 750 fps. This load, while very accurate, made targets very difficult to score due to the irregular holes it tore through the target paper. Something better was called for (probably by some guy who lost a match by 1 point). "For the .44 S&W Russian revolvers, designed by A. L. A. Himmelwright, former president, United States Revolver Association, especially to cut a clean full-sized hole in the target and give the shooter the full value of his shot. Known as the "wad cutter bullet." Early Ideal Handbooks called for loading this bullet over 2.8 grains of Bullseye in the .44 Russian case for about 725 fps. This bullet has no crimp groove, and apparently the standard practice was to fill its two generous grease grooves with lube, seat the bullet deeply and place a light roll crimp over the forward driving band. The prodigious proboscis meant that the seating and crimping operation could be carried out in a single step (something not always possible with later wadcutter designs as the seating stem could interfere with the crimp). Such loads recoiled more lightly than the standard .44 Russian loads, allowing shooters to recover their sight picture more quickly in rapid fire strings, and the wide shoulder was intended to cut a clean full caliber hole in target paper. This is a landmark bullet, not just for its bizarre shape, but because it is the first handgun bullet that was designed for one specific task, as opposed to being a general purpose projectile. We take that concept for granted today with highly specialized projectiles for everything from self-defense, to hunting dangerous game, to various forms of competition (silhouette, bullseye, IPSC, etc.). The Himmelwright wadcutter is kind of an odd-duck as projectiles go, but I think it's important that we recognize the significance of Mr. Himmelwright's willingness to tailor bullet design for a highly specialized function. This was an important step in the development of the high-performance handgun ammunition that we take for granted today. "For .38 S&W Special revolvers. Bullet as illustrated, cast of 1 part Tin to 25 parts Lead, will weigh about 112 grains. It is very accurate for short range and cuts a large clean hole in the target. Designed by A. L. A. Himmelwright.... (Can also furnish a mould to cast bullet with base band about as wide again, weighing about 130 grains.)" Of the various powder charges recommended for this bullet in the .38 Special was 2.5 grains of Bullseye for 790 fps. A while back I bought a S&W First Model Military and Police, with a serial number in the 11xx range. This gun was made in the first couple of months of the first production run of guns ever chambered for the venerable .38 Special. This gun has been polished down and re-blued, so it has lost a significant portion of its collector's value, but mechanically it's in good shape -- the timing and lock-up are good, and the bore and cylinder are very good. The one unfortunate detail of this gun is the fact that at some distant point in the past someone had ground down the front sight to roughly half of its original height, presumably to get point of aim and point of impact to jive for their particular pet load. Not surprisingly, with standard weight bullets (i.e. 158-160 grains), this gun tends to shoot quite high at normal ranges. In thinking about light bullets that I could use to get this revolver to shoot closer to point of aim, it occurred to me that this revolver was contemporary with the Himmelwright wadcutter and the selection of lightweight .358" diameter bullets was pretty limited during that timeframe (there were a few others, but very few). Thinking that perhaps the previous owner had set this old M&P up for target shooting and had regulated it for the Himmelwright wadcutter, I decided to assemble some test loads and see what I could learn. So I broke out my 2-cavity Ideal 360302 and fired up the lead pot. Casting the 360302 was pretty much like casting any other bullet, and soon I had a shiny little pile of Himmelwright wadcutters (114 grains when cast with a 3:1 mix of range scrap to linotype, approximately BHN 12, similar to WW). For a modern caster, that is pretty much where the similarity to modern cast bullets ends. With that pronounced proboscis sticking out the front, none of the standard nose punches work (and nose-first sizing, as with the Star, may blunt the nose in the process of pushing the previous bullet along). A number of years ago I had made a nose punch for .30 caliber spitzers in which I had center-bored a .30 caliber nose-punch, and then taper-reamed the cavity. This nose-punch proved satisfactory for the Himmelwright wadcutters (although it did leave a slight "ring around the collar" of the sized/lubed bullets). Bullets were sized .358" and lubed with homemade Moly lube. Test loads were assembled with 2.6 grains of Bullseye and Winchester Small Pistol primers. Bullets were seated using a standard round-nose seating stem, and this blunted the tip of the nose very slightly, but not enough to be of any consequence. Test firing at 50 feet revealed that the Model 1899 First Model M&P was still shooting somewhat high, but at least now many of the shots fell into the black. An interesting observation -- while the full profile of the bullet was indeed visible on the target, the hole in the paper was not the clean round hole that we would associate with a wadcutter today. Portions of the bullet holes were gone, but a significant portion of the paper still remained in each bullet hole, and there were typically horizontal tears emanating from the top and bottom of the bullet hole going out to both sides for half an inch or so (targets were hung from a clip and not stapled onto a backer, and this may have influenced the tearing pattern). The original Ideal advertising copy claimed that the Himmelwright design would cut "a large clean hole in the target", and in these tests that did not prove to be entirely true (however it is clearly true that scoring these targets would be significantly easier than if round-nosed bullets had been used). In any event, with the exception of a flyer or two, the old Model 1899 M&P seemed to shoot the Himmelwright wadcutter acceptably well, and closer to point of aim than any other bullet I've tried to date in this gun, however accuracy wasn't what one would normally associate with a highly regarded target bullet, so I decided to run some of these loads through another gun to see if the limitation was due to the gun or the bullet. A .38 Special M&P Model 1905 Target (circa 1909), with an established reputation for fine accuracy (and a pristine bore), was chosen as a suitable (and period correct) test vehicle. Long story short, time and time again, 10-shot groups at 50 feet consistently went into one ragged hole measuring about 1 1/4". Clearly, the .38 Himmelwright wadcutter is capable of providing good short-range accuracy, in the right gun. As expected, recoil with these light target loads was in the pop-gun class, and there was zero problem with leading. These results got me to thinking about the original Himmelwright wadcutter and learning more about how it shot. I do not have a S&W Model 3 .44 Russian to shoot these in (maybe someday....), but I do have one or two .44 Specials that I could make do with. To start off with, I chose a 5" 2nd Model Hand-Ejector (circa 1931) since it was the closest thing I had to being contemporary with the Himmelwright bullets (the Himmelwright wadcutter was originally designed around 1900 and cataloged up through Ideal Handbook #39, published in 1953). I do not have a mould for the Ideal 429220, but a good friend of mine does (an old 6-cavity Ideal Armory mould that has been in the family since it was bought new in 1910). He was kind enough to cast up a batch of these for me a while back (178 grains, cast with wheel weight alloy), and here was my chance to work with them. These Ideal 429220s were sized .431" and loaded over 2.9 grains of Bullseye in W-W .44 Special cases. Not surprisingly, this light 178 grain bullet shoots low (~4" at 50 feet) from the fixed sight 2nd Model Hand Ejector (which is nicely regulated for 250 grain bullets). Once again, groups were acceptable for a service revolver, but not good enough for serious target work (~2 1/2" at 50 feet). The unusual horizontal tears in the target paper (described above) were once again observed. And once again, recoil was light and there was no problem with leading. Since experience with the .38 Himmelwright wadcutter had shown that a cleaner, tighter bore could have an impact on group size, I decided to try these loads in a USFA Flat-top Target .44 Special, with an immaculate bore (while this gun was not itself contemporary with the Himmelwright wadcutters, its design most certainly is). Once again, groups were in the 2 1/2" to 3" range at 50 feet, and this fine sixgun is capable of significantly better. I can only conclude that there must be some limitations to the Himmelwright wadcutters. I suspect that this has something to do with alignment issues, as the Himmelwright wadcutters have the combination of a short overall bearing surface and a long nose. In other handgun bullets this combination of short bearing surface with a long unsupported nose can be the kiss of death in terms of accuracy (in rifle bullets this can be overcome by gaining additional support/alignment from the tops of the lands and making the nose bore-riding, but that is not possible in the throat of a revolver cylinder). Of the guns I shot the Himmelwright wadcutters in the Model 1905 Target has by far the most shallow forcing cone (only ~.050"), meaning that the gap between the throat and the lands/grooves is unusually short, so the bullet is still supported by the throat when it's getting engraved. This leads to better alignment, and hence, tighter groups. The other guns have more deeply cut forcing cones, leaving more "wobble room", and greater chance for misalignment. There is a reason that wadcutter design evolved towards bullets with longer bearing surface (e.g. the classic H&G #50, or the Lyman/Ideal 358495). Longer bullets are still well supported by the throat as they reach across the forcing cone gap to begin the engraving process. 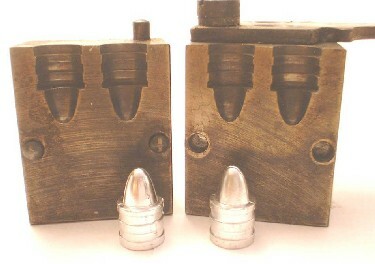 Aside from the unusual nose on the Himmelwright wadcutters, another unique feature found on these bullets is their capacious lube grooves, especially for a bullet intended for light target loads. I suspect that this is a reflection of the times in which they were designed. This could be a hold-over of "black powder mentality" in the hopes of maintaining competitive accuracy for as many shots as possible by minimizing fouling with an abundance of lube, or it might even be a hint that some of the early target shooters were shooting the Himmelwright wadcutters with black powder. In any event, these bullets hold far more lube that is needed for mid-range target loads assembled using smokeless powder. All in all, this has been a very fun little project, a chance to shoot the original target bullet out of some old period-correct revolvers and experience first-hand what some of the early bullseye competitors worked with in order to earn their medals and trophies. All told, I don't really see that there is much call for the Himmelwright wadcutters today, as there are more accurate bullet designs out there now, and bullet designs that do much a better job of cutting clean holes in target paper, and the Himmelwright wadcutters provide no advantages for use in speed-loaders, or handgun hunting, or the long-range accuracy needs of silhouette competition. Nonetheless, there is a nostalgic itch that can only be scratched by using the original bullet, and the Himmelwright's are the original wadcutter, and a bold step forward for competitive handgun marksmanship.